Sinfully delightful, the ‘rangeen pulao’ (coloured rice and lentils) from the royal Mughal kitchens, Emperor Akbar’s favourite ‘khasa tilaai’ exotic hill flavours of Uttaranchal, the Arabic lentil shorba with cumin, and several lentil delicacies from Lucknow and Benares, Bihar and Rajasthan, Odisha and the North-east, Karnataka, Maharashtra, Bengal and Tamil Nadu catch our imagination. And finally, the ‘shyama sundra, a yogic lentil soup served at an ashram in Rishikesh. So, it’s me, the writer of this review who is the one in her regime who loves it the most – Pulses. I have had secret or not-so-secret love towards them since my childhood. Morning, noon, night, bring it on (but make sure it’s hot!). My angelic grandfather told me a story about the secret lives of pulses when I was a child (my mother’s dad to be specific, as I could never meet my other prominent GF, my father’s dad to have another account). He also narrated an anecdote to me, I remember, where a poet was asked by his king to select any one food item from the bhandaar-griha to manage his complete life. The poet, without much thought said – daal. The king asked for some insight which the poet keenly proffered by saying – “It can turn into everything – the dip, the sauce, the bread, the steamed cakes, the liquor and not to forget the dessert, and the list goes on. I can survive with that.” Everyone was enamoured, me too. 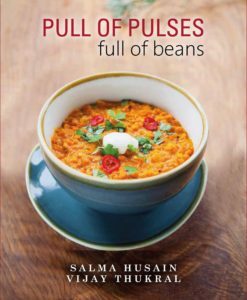 Few weeks back, an unusual kind of book Pull of Pulses: full of beans written by Salma Husain and Vijay Thukral and beautifully brought up by Niyogi Books reached my table and took me back to my childhood days and made me rethink about the stories I have had since I was a kid. The book reminded me of my angles who reside in my heart through their stories, which never die and my pull towards pulses which remains there, still. The book takes us to the world of pulses – “popular jewels”, ranging from its historical background, forms, varieties, values, several tales behind them, to its process of becoming and making along with multiple exhilarating recipes thwacking the old ‘misrepresented’ phrase of our culture “ghar ki murgi daal baraabar”. The cuisines roped into the book are from the family of soups, salads, pulao/rice, daal, international recipes, breads/roti and desserts too ! The well-researched book also accompanies a section on spices along with a glossary, a chapter on measurement methods and a bibliography. It would be great to dip into this saga of eternal bliss. Go, have ‘em tasted ! While legumes, pulses and lentils are used in many parts of the world – North Africa, southern Europe, West Asia, China and the countries of Latin America – it is in the Indian sub-continent that they are cooked not just on a wide scale but also with unmatched culinary skills and imagination. The daal is a staple food of this region, consumed by all economic brackets at all times of the year. This book is a tribute to the rich and awesome diversity of Indian gastronomic traditions. The recipes in the book – that include not only daal curries but also daal-based snacks, savouries and sweets – cover most regions and communities of India. It also includes several international lentil recipes. A deep knowledge of world cuisine and fine understanding of flavours have immensely helped in raising the bar of one of the simplest fares of the world. Salma Husain is a passionate cook, food historian and a Persian scholar; she has used the language in exploring the history of food. Salma has worked with the Star Celebrity Chef Gary Rhodes from London for a British television serial and also with South Korean Television for their series on Indian food. She has appeared on Indian television with her feature Journey of Kabab, which has been telecast by Urdu TV as well. Salma has worked as a consultant of Indian food with ITC Hotels. She writes on food for popular journals and newspapers and has award-winning cook books to her credit. Her Flavours of Avadh (Niyogi Books, 2015) is a lively documentation of life and food traditions of Lucknow and adjoining areas. Salma received the National Tourism Award 2009 from the Vice-President of India Md. Hamid Ansari. Salma Husain lives in Gurgaon, Haryana. She enjoys cooking for her friends and does it with great love and passion. Vijay Kumar Thukral, Executive Chef, India International Centre, Delhi, has been serving the global hospitality industry for more than 35 years and the IIC since 1988. Trained in Food Craft and Food Production (Cookery), he supervises the IIC F&B section, specially contributing to IIC special dinners and food festivals. Thukral published Secrets from the Kitchen: Fifty Years of Culinary Experience at the India International Centre with Bhicoo Manekshaw (Niyogi Books, 2013). 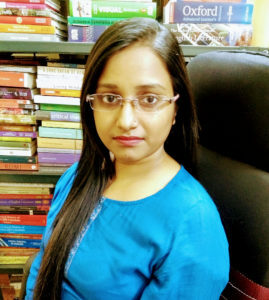 Varsha Singh (M.Phil., Ph.D.) is an Independent Researcher, Critic, Poet, Translator and Editor from Jharkhand. She writes in English and Hindi. Along with being the Managing Editor of Reviews, she edits for several national and international journals. Her published books include Deluges: A collection of poems, 2014, (Authorspress), Unbangled and other Poems, 2015, (Authorspress), Bhor – A Collection of Hindi Poems, 2016 (Authorspress), The Midnight’s Grandchildren: Articulating the Postmodern Spirit in English Fiction of India, 2017, (Authorspress), Parbati the traitor and other poems, 2017, (Authorspress), Recluse: Contemporary Verses, 2017 (Ed., Authorspress), Building Bridges: Kannada and Hindi Poetry (Co-authored, Upcoming in 2018 from Authorspress), Critique on Transformational Art of Dilip Mohapatra (Ed., 2018, Authorspress). She has been widely featured in several journals, books and magazines.